With terraced properties back-to-back in many of our towns and cities, and more and more new builds springing up ever closer together, our gardens aren’t always as private as we might like. 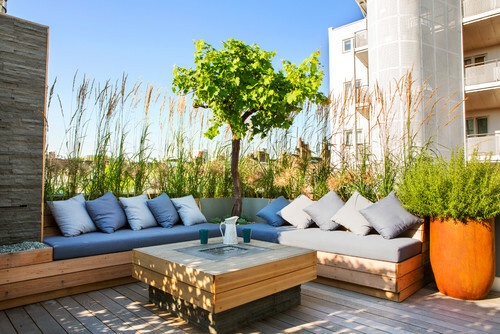 To really enjoy your space now we’re approaching the warmer months, it’s a good idea to create a garden that’s yours only. Even if you can still hear your neighbours, there are ways to make sure you can’t always see them (even if you like them! ), and they can’t see you. And if you can hear them a bit too much, take a look at the tips for reducing surrounding noise, too. 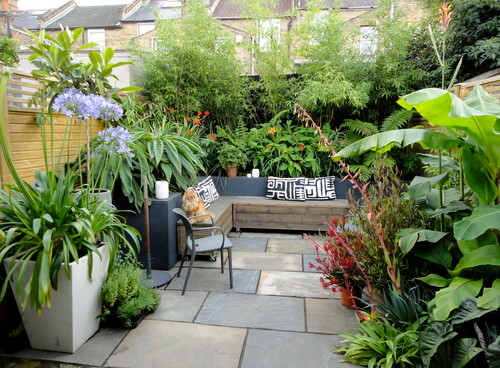 By using a combination of solid structures and clever planting, you can create very attractive boundaries around your precious outside space. Browse these garden designs to get you started. There’s no better way of creating privacy than having your own outdoor paradise brimming with plants. Try the following: elephant’s ears (or Bergenia), which have lots of colourful flowering options; Japanese maple, for beautiful deep red leaves; bamboo, which is really hardy and grows nice and tall (see more about bamboo below), and Skimmia (for a very pretty white flower with a lovely scent – great for smaller spaces). For shady areas, try Hostas. Slugs and snails like eating them, so you have to tend to them frequently, but they have lovely large leaves and are great for good coverage. Palms and ferns can grow to an incredible size and their leaves can be very sprawling, so you can begin to build some cover. Using a combination of planters and beds is a nice way to break up the height. Try introducing flowering plants to help it feel less like a crowded jungle. 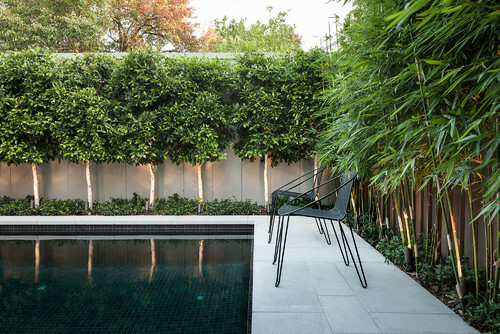 While most of us know that mirrors help spaces look bigger, not many of us would consider using them in our gardens, but it’s actually just as effective. You could do an entire wall in mirror to create a really bold statement or just use it in panels alongside your other wall treatments. Be careful not to introduce too many materials for your boundary walls – any more than three and things might start to feel a bit muddled. If you’re worried about inadvertently creating more exposure by using mirrors, simply put them behind your planting to make that side of the garden more interesting, and give the illusion of thick coverage. 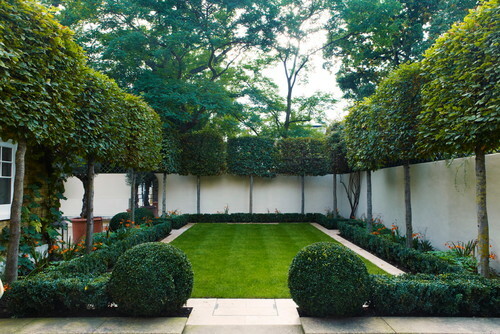 Most of us prefer privacy in our gardens, but some of us don’t want to be in a high-walled box. Sometimes, just having areas filled with tall plants and grasses can give you the feeling you’re more secluded than you actually are. If the grasses move easily, then that can help obscure the view. Bamboo would also work well in this scenario. Bamboo deserves a point all of its own! This plant provides a fantastic way to create a dense border, and it should grow to a decent height, too. Bamboo is also helpful in noisy areas: the dense foliage helps to baffle sound and, when the wind picks up, the lovely, gentle rustling of the leaves can help to soften any surrounding noise. And it’s so interesting to look at that, if you choose this option, you really don’t need to do much else. If you choose to build upwards, high painted walls will look less severe covered in leafy plants. There’s another great idea in this garden, too – using a water feature to cancel out any noise you might hear from your neighbours and the general bustle. The polished chrome of this water feature bounces light around and casts subtle reflections, adding a softness to the space. If you’ve chosen high walls to create privacy, another idea to stylishly dress them is to try an inlay design. Ornate tiles set into a rendered wall add colour and texture. You could also do this with a strip of copper or antiqued glass to reflect the light. There are plenty of different colours of render, so you don’t need to keep to white if you prefer something a little more jazzy in your garden. Consider teaming a rendered wall with some wooden panelling – it will help the space feel warmer. 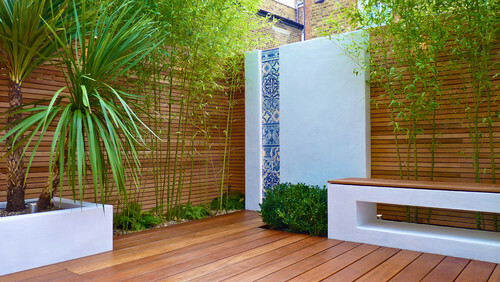 If you’re nervous about building anything permanent or you have concerns about your boundary, freestanding pots are a brilliant way to create a bit more privacy. They’re also a good solution if you’re not particularly green-fingered, as you can experiment with how things grow and it won’t be as devastating if any of the plants fail. 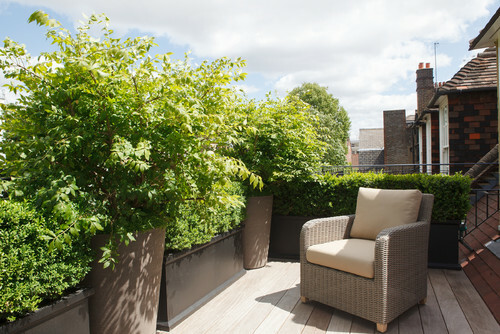 Using a combination of low troughs and tall planters gives you a nice elevation that looks contemporary. Different levels of bedding boxes also allow you to easily add more height to areas where you’re most overlooked. Planting trees is a great way to add privacy, but they can also become a bit oppressive. Standard trees, or lollipop trees, as I like to call them, can look much neater, and you get more space around the base for other planting. 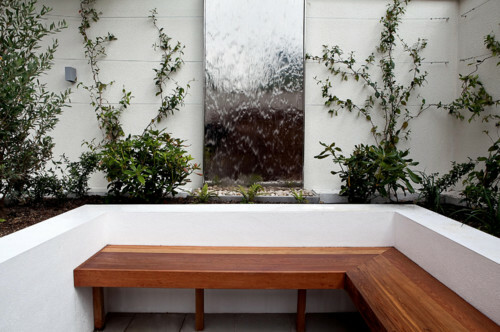 A covered area is a brilliant way to have the utmost privacy in your outdoor space. Slatted designs like this one allow you to still enjoy good light and see the view, but make it hard for neighbours to see in. 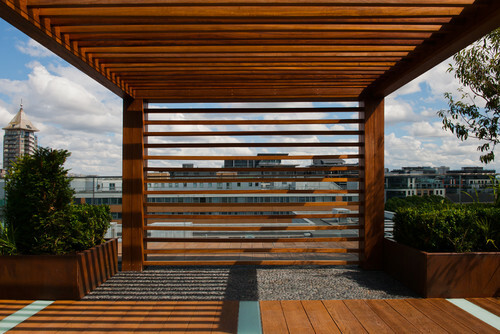 On sunny days, slats can also provide a lovely amount of shade and cast attractive shadows around the space. Be areful with creating any kind of structure like this, however, as it might conflict with planning regulations. If in doubt, alway seek advice from your local authority. Get more ideas for garden structures by browsing photos of gardens with pergolas. 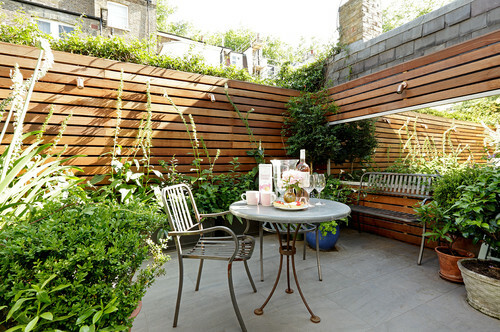 We’re all familiar with the more standard fencing you see between people’s gardens, but you don’t have to have this stained in just your typical teak colour. 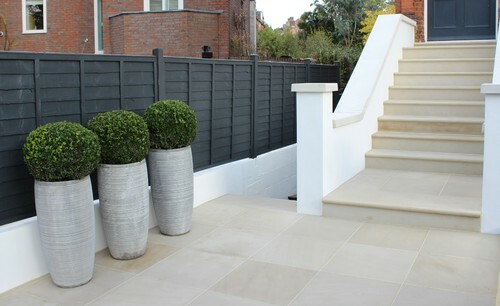 Fences can look great in a variety of different shades – the dark grey seen here works especially nicely with leafy greens – and the more layers you add, the more dense the tone you can achieve. Here are some examples of properties with well maintained gardens currently avilable for purchase. If you're interested in buying or selling contact one of our local branches.